In 1898 the Riverside Building Co. began construction of a row of eight rowhouses that would begin at No. 320 West 80th Street and wrap around the corner to No. 74 Riverside Drive. In fact, the architect of the row, Clarence True, owned the development firm. By now the prolific designer was so successful that he could be a one-man show; eliminating the need for a developer or contractor. Clarence True routinely worked in historic styles and for this project he chose Elizabethan Renaissance Revival. The total cost of the project was estimated at $266,000--more than $1 million each today. Six of the homes were faced in red or tan brick. No. 320 West 80th Street, on the other hand, wore a suit of chunky red ashlar which, coupled with the full-height rounded bay, gave this narrow, 17-foot wide structure a turret-like appearance. True's choice of ashlar, the same sandstone used by Henry Hobson Richardson in his masterful North Congregational Church in Massachusetts, gave the structure a redder, less heavy appearance than the more ubiquitous brownstone. While the blocks of the second through fourth floor were undressed, that ground floor facade was formally planar. Here delicate carvings graced the arched openings, spandrels and the frieze below the cornice. Facade repair resulted in the loss of carving. True did his best to make the service entrance, right, unnoticeable. The fifth floor took the form of a mansard with a single, lofty dormer. The solid parapet here would have provided privacy to servants who moved bedding outside on steam summer nights. No. 320 was quickly sold. On April 23, 1899 The Sun reported that it had been "bought by ex-Postmaster-General Thomas L. James." The very fact that James chose this house and block testified to the extremely upscale nature of the area. Beginning his career as a printer and newspaper owner upstate, he had worked for the government since moving to New York City in 1861. He reorganized the operations of the Custom House and quickly rose in governmental positions. In 1873 President Rutherford B. Hayes appointed him Postmaster of New York. As he had done with Customs, he overhauled the efficiency of the mails--increasing the number of deliveries, instituting a "fast-mail service," and expediting foreign service, for example. When President James A. Garfield put together his cabinet, he selected James as his Postmaster-General. When James took his position, the postal service was running at a $2 million deficit. He attacked the problem as he always did--by reorganizing, ferreting out fraud and abuse, and in this case, reducing the clerical force. His changes made up for more than the shortfall. James resigned following Garfield's assassination, focusing on his office as president of the Lincoln National Bank. His library in the 80th Street house was impressive. The New York Times noted in 1899 "Gen. James is constantly adding to his collection of books, his aim being to accumulate on the shelves of his library the best that there is in general literature. He does not aspire to be a collector of specialties. He has a taste for pictures and other beautiful objects in art, which he gratifies judiciously." James maintained a summer estate in Englewood, New Jersey. He became seriously ill there a few months after purchasing No. 320. But on August 19 The Times assured readers that James, "who has been ill at his home here for several days with congestion of the lungs, is much better, and will be able to sail for Europe on Wednesday next." In case readers were distrustful, the newspaper noted on September 23 that he had arrived in London. "He is in fine health." The trip was brief, especially considering that the back-and-forth voyage would have consumed several days. On October 9 he was back in his office at the bank. Also brief was James's ownership of No. 320. He returned title to Clarence True by the spring of 1900; and on June 20 newspapers announced that it had been sold. The buyer was J. Milton Doremus, vice-president of a drug firm. He and his wife, Isabella, had an 11-year-old daughter, Miriam. Doremus took an active interest in his new neighborhood. In October 1902 he was elected to membership in the West End Association, a politically-active group that lobbied for improvements on the Upper West Side. He would become a strong voice within the Association for years. Shortly after moving into the house, Doremus had been selected to sit on a grand jury regarding the failure of a bank. It was a relatively uninteresting case. But in the summer of 1903 he found himself on a highly-publicized and potentially dangerous trial involving gangsters, labor conflict, and threats of violence. Labor differences and strikes in the first half of the 20th century were often violent--sometimes involving beatings, arson, and even bombings. Samuel J. Parks, a leader of the Housesmiths' and Bridgemen's Union, was on trial for extortion--forcing business owners to pay large sums before union workers would return to work. The Evening World called the trial "really a struggle between capital and labor in one of the ugliest forms." The newspaper said that those who dared to testify against Parks had "splendid courage." Although there had been threats against the prosecution team, when the jury was been finally selected on August 17, the New-York Tribune printed the home addresses of each jury member. Nonetheless, Doremus was apparently unruffled (possibly because of the large number of detectives reported to fill the halls of the courtroom). At one point in the trial he directly questioned a witness for the defendant. It took the jury only a day to deliberate and the verdict was announced nation-wide. On August 22, 1903 the Maysville, Kentucky newspaper, The Evening Bulletin, reported "Samuel J. Parks, the labor leader, who has been on trial for several days charged with extortion...was found guilty." Around 1909 J. Milton Doremus gave up the drug business and took a job with the Brooklyn-based Paddock Cork Company, which manufactured products like bulletin boards for schoolrooms. The American Druggist and Pharmaceutical Record viewed the job on par with a religious defection, calling him a "proselyte." The last major entertainment for the family occurred on November 7, 1914. On that day Miriam was married to Ripley Ropes in the Central Presbyterian Church. The Princeton Alumni Weekly reported "After the ceremony a reception was held at 320 West 80th St."
At the time her parents were preparing to leave Manhattan. 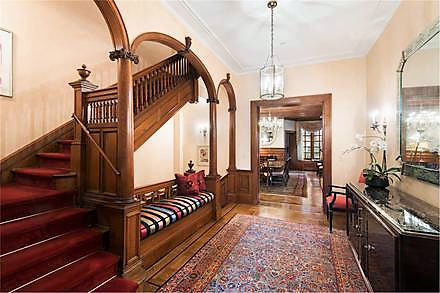 On May 5, 1915 the 80th Street house was sold to Rhoda F. Greene. Two months later J. Milton and Isabella Doremus moved into their newly-completed "fifteen room Colonial House," as described in the Real Estate Record & Builders' Guide, on Manhasset Bay, Long Island. The journal called it "one of the most attractive on the North Shore." Rhoda Green would remain in the house for years. It seems possible that although she never married, her life was not without romance. She had a close friend, Charles Albert Schieren. The wealthy bachelor was the son of the former Brooklyn mayor and principal in Charles A. Schieren & Company, leather and belting manufacturer. The younger Schieren died on December 4, 1932. His will left Rhoda $100,000 "in recognition of her friendship for me." The token of friendship would be more than $1.8 million today. Rhoda's summer estate was at Long Branch, New Jersey. It was there that she died on May 25, 1936. Her funeral was held in the 80th Street house two days later. No. 320 was soon purchased by Paul and Mary Cinkosky. They "modernized" the house, according to The New York Times on December 27, 1937, before leasing it to a single tenant "for occupancy." The Cinkoskys, Hungarian immigrants, seem to have fudged a bit on the documentation, for they received a "multiple dwelling violation" shortly afterward. The Cinkoskys retained possession of the house (now leased to single residents) until 1943. Perhaps because of its slim proportions, No. 320 remained a single-family house until 1969. The new owners initiated a renovation, completed in 1971, which included a separate apartment on the ground floor. That was reversed around 2001, returning the house to a single-family home. Stone reparation included in one of those renovations resulted in the loss of carved decoration. No. 320 was recently placed on the market for $7.65 million. Cost factors, no doubt, resulted in the replacement parapet being unexpectedly austere. Although much of Clarence True's interior detailing has been lost; much remains. And except for the loss of the carvings, his romantic, rosy-red citadel survives intact.